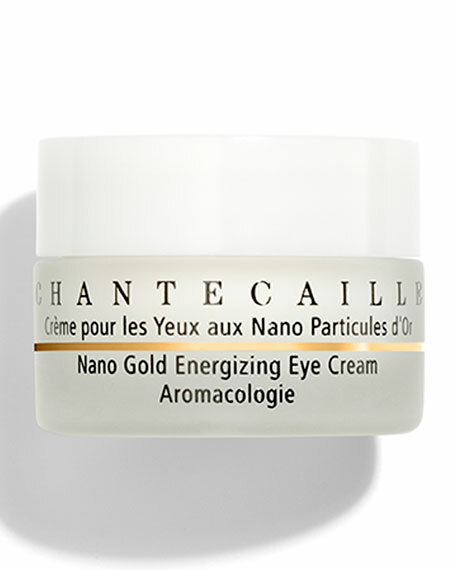 ChantecailleNano Gold Energizing Eye Cream, 0.5 oz. A wonderfully nourishing eye cream rich in advanced botanicals that work to instantly make skin around the eyes look smoother and firmer*. Infused with peptides and plant stem cells technology to help reduce the look of fine lines, dark circles and puffiness*. Apple Stem Cells Complex lessens the appearance of lines and wrinkles for a more youthful appearance*. Dark Circle Enlightener: a blend of peptides that work to moisturize and soothe dry skin and lighten the appearance of dark circles*. Anti Puffiness complex helps reduce the looks of puffiness and helps promote firmer looking skin*. Pullalan/Algae Extracts a tensing agent that creates a smooth film on skin to instantly and visibly reduce the appearance of lines. It also works over time to promote more firm looking skin*. Caffeine helps reduce the look of puffiness*. Alpine Skullcap/ Elderflower Extract are rich in moisturizing components that soothe. White Tea is rich in powerful antioxidant. 83% naturals, including a base of pure rosewater.